In Qur’anic studies, the expression (MuĄkam) is the antonym of (MutashĀbih). 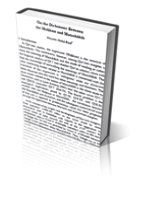 the meaning of MutashĀbih and the mode of reading or rather the linguistic analysis of 3:7 and whether Qur’an scholars share with God the knowledge of unravelling the meanings of MutashĀbih. The other interesting matter related to MutashĀbih is concerned with the translation of this expression as ‘ambiguous’ hile our discussion below illustrates that this word has other meanings and functions.